One way to help with account security is to get a Neverendless Authenticator which you can find Here. If you still have questions or doubts about what an Authenticator is or what it does then please read the rest of this guide. What is the Neverendless Authenticator? The Neverendless Authenticator is an optional tool that offers World of Warcraft players an additional layer of security to help prevent unauthorized account access. The Authenticator itself is a piece of software that runs on a cell phone. How does the Neverendless Authenticator work? You must first associate the Neverendless Authenticator to the World of Warcraft account you play. Once the account has been linked, the Authenticator token will be required to log into Account Management or to the game; when logging in, you will be prompted to supply a digital code generated by the Authenticator. Can I use the Authenticator on my computer or do I need a phone for it? Yes you will need a phone. At the moment the Neverendless Authenticator is available as an Android application, or as a Java MIDlet app for some other types of cell phones. The Android application requires at least Android 2.0. The Java version requires a phone which supports J2ME and MIDP-2.0. Although if your phone does support J2ME but not MIDP-2.0, then you may be able to use an older version of the authenticator we have available. How do I find out if my phone is compatible with the Authenticator? You can check your phone's manual for the specifications for your phone. You could google your phone or go to the phone manufacturer's website. GSM Arena is also a good place to check, as it has a list of most phones with their specifications. The Neverendless Authenticator is free to download and install, however the application will need to contact the Neverendless Servers once after installation in order to configure itself, and again afterwards if your cell phone's internal clock goes significantly out-of-sync with ours. Your network operator may charge for the data tranferred in these cases, however the application will never do this without asking you first, and the data transferred in these cases is very small, only 1 or 2KiB. How do I associate a Neverendless Authenticator with an account? 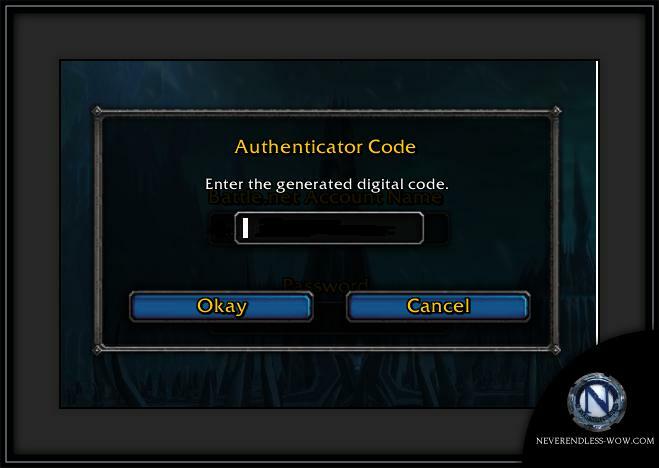 You can associate your Neverendless Authenticator to the World of Warcraft account you play by logging into Account Management. Click the "Authenticator" tab and then enter the serial number on from your Neverendless Authenticator. What is a digital code and where do I see it? The digital code is an eight-digit numeric code that is produced when you open your Neverendless Authenticator. Each code is unique and is valid only once. Where do I enter the digital code when I log in to World of Warcraft or to Account Management? After you enter the account name and password, you will be prompted to provide the digital code from your Neverendless Authenticator. You must open your Authenticator and enter the code it displays to complete your login. Can I apply my Neverendless Authenticator to more than one account? Yes! You're welcome to associate a single Neverendless Authenticator to as many accounts as you like. Please remember that you must have that Authenticator with you to log in to any of these accounts afterwards. Can I keep one Neverendless Authenticator at home and another at work, and have both associated to the same account? No. Each account can have only one Neverendless Authenticator linked to it at a time, so you would need to carry the Authenticator with you to log in from different computers. Will my Neverendless Authenticator work while I am traveling? Will it work in other countries? 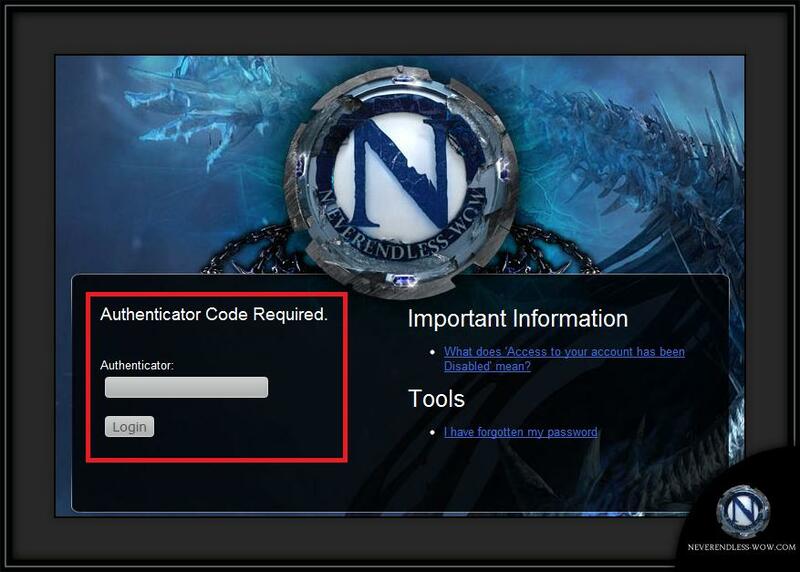 Yes, the Neverendless Authenticator will work anywhere you can log in to World of Warcraft. Please note that if you do allow the Neverendless Authenticator to connect to the network, data charges may be higher than in your home country. Can I turn the extra security of the Neverendless Authenticator on and off as I wish? Yes, you can do so through your Account Management page using the serial number of the Neverendless Authenticator. What do I do if my phone breaks or I lose my phone? How do I access my account or remove the authenticator? You will need to make a Lost Authenticator Support ticket, from another account that doesnt have the Authenticator you are removing, to have an Admin remove the Authenticator from your account. You will then have to reload the Authenticator to your new phone and "link" the new one to your account following the instructions here. Will a Staff Member ever ask for my Neverendless Authenticator information? Yes. Neverendless Admins may ask for the serial number from your Neverendless Authenticator, typically to help you associate it to an account or to verify your ownership of that Authenticator.